Each month Bank Insights reviews news from regulators and others to give perspective on regulatory challenges. Dallas Fed Paper: Are Community Banks Too Small to Succeed? The average civil money penalty has increased in recent years, and directors should take note. The Office of the Comptroller of the Currency has revised its Policies and Procedures Manual that addresses these penalties, replacing a 1993 manual. The revision includes a new matrix that awards points for violations and then calculates those points into suggested fines. (No fine can exceed 1 percent of the bank’s assets). Penalties are typically imposed for misconduct and blatant disregard for safety and soundness rules and BSA/AML issues. Remember: Directors cannot use a bank’s D&O policy to cover an individual civil money penalty; they must either pay out of pocket or purchase an individual policy that specifically covers the officer. Merger and acquisition proposals made up 23 percent of all approved Federal Reserve proposals in the first half of 2015, the Fed disclosed in its latest report on banking applications. The Fed reported that the number of approved M&A proposals increased to 136 in the first half of 2015, compared with 114 a year earlier. Community banks with assets below $1 billion increased the number of branch applications, from 44 in the first half of 2015 compared to just 28 a year earlier. On average, the larger community bank M&A deals ($1 billion to $10 billion in assets) took 63 days to go through the final approval process, while the smaller deals (less than $1 billion) took 59 days. Manage interest rate risk in a prudent manner, the FDIC has once again urged. More balance sheets “reflect a heightened mismatch between asset and funding maturities that, coupled with tighter net interest margins, have left financial institutions more vulnerable to rising interest rates,” the FDIC said. In response, it has issued updated videos that address recent data, trends and board and management responsibilities, types of interest rate risk, risk measurement systems, modeling assumptions and other topics. The videos include a 33-minute one tailored for directors and another series for key management and staff. FDIC Chairman Martin J. Gruenberg also cited interest rate risk when releasing the fourth quarter FDIC bank data. 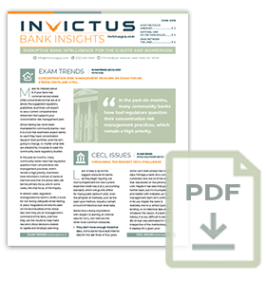 “Banks must remain vigilant as they manage interest rate risk, credit risk, and evolving market conditions. These challenges will continue to be a focus of ongoing supervisory attention,” he said. 1 Although for all scenarios the CCAR document claims: “It is important to note that this is a hypothetical scenario designed to assess the strength of banking organizations and their resilience to adverse economic conditions [or “unfavorable economic conditions” in the severely adverse case]. This scenario does not represent a forecast of the Federal Reserve.